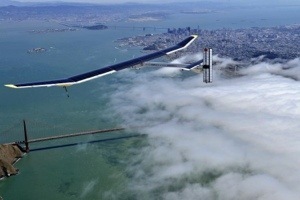 A solar powered aircraft took its maiden voyage in San Francisco this week, details were covered in an article on the awesome co-exist website. The maiden voyage was the start of a trans-american flight that ends in New York in July this year. I would imagine its early days for this type of application of solar power – they are already working on a the next evolution which is targeting a round the world trip in 2015. What is exciting is the future possibilities. We first saw a fossil fueled trans-atlantic airplane crossing in 1919, it took 72 hours and almost 100 years later you can fly to almost anywhere in world within 24 hours. Jump forward another 100 years and I wondered what solar powered flight will have been transformed into! Will we still be flying around the world? If we are I would imagine solar power will have something to do with it.